A report has recently been posted on line by honest john who seems to prove what many of London’s cabbies have been saying for years. Analysing hundreds of complaints from drivers who say ‘sleeping policemen’ are wreaking havoc on their cars, the report suggests what many have suspected that these aids to road safety are, in fact, having the opposite effect. Their perceived effectiveness at improving road safety have seen London’s councils place them in every corner of their domains. The report asserts that repeatedly traversing speed humps in the same vehicle causes long-term damage to key components, especially tyres and suspension. As the vehicle transverses the hump the weight of the vehicle is distributed to the inside of a tyre rather than spread evenly, and the sloping design of humps effectively ‘drags’ the edge of the tyre along them, putting a large amount of pressure on the tyre and body of the wheel. As a result greater tyre wear results and the side walls are in danger of collapsing at high speed. Another effect speed humps have on vehicles, so often realised by cabbies, is the increase in wear on suspension and shock absorbers which reduces the effectiveness of braking. What hasn’t been acknowledged by councils is the damage done to roads with the constant thump-thump of vehicles mounting these ‘traffic calming measures’. Many of London’s potholes are to be found in the vicinity of speed humps, caused by the vibration as vehicles amount these obstructions. When a vehicle mounts a speed hump shockwaves are sent through the ground damaging the substructure of the road, and even nearby buildings, it is for this reason that building regulations require speed humps are not built within 25 metres from bridges, subways or tunnels. In a recent post CabbieBlog highlighted a trial of automatic traffic speed monitoring, and if it means an end to this practice by councils which endanger everybody’s lives, then maybe total surveillance by Speed Spike might be the lesser of the two evils. We could of course drive with more consideration for other road users, but I fear I’m in the land of fantasy now. When I had a car, I greatly disliked speed humps. Now that I ride in buses I still dislike them. 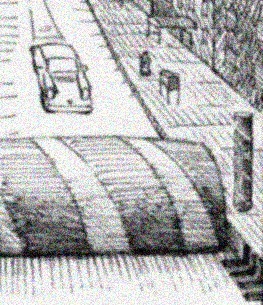 If you are lucky, narrow humps will have been installed and the bus wheels will run either side without causing the sickening up-and-down movement but where wide humps are installed, such as those “platforms” on which pedestrian crossings are often built, then it can be very uncomfortable. I suffer from bouts of severe back pain and I remember one long bus journey where I had to remain standing, pressed against the wheelchair cushion, to lessen to impact. Cameras don’t really help as becomes obvious if you watch a stretch of road furnished with cameras. Drivers still exceed the speed limit. Very few are ever prosecuted and I read that half of the fines imposed by courts are never paid. Speedsters can afford to ignore cameras. I think the time will come fairly soon when average speeds will be calculated and we can at last get rid of humps. Oh Yes! Got caught stopping on a zig-zag by one of those cameras recently – £60 !